Well, I guess David’s back sores have healed. He has been quite active over the past few weeks. Christmas Eve he was able to travel, with his family, 45 minutes out to Francestown for Christmas Eve service with our church family at the Community Church of Francestown. We made it. David held up well and it was great seeing a lot of friends that we had not seen in a long time. We are hoping to get back out there again soon. The weekend after that he travel 70 miles down to Massachusetts for a holiday gathering with his extended family. About a week after that he traveled to Boston and back with his brother Jason to see the Nitro Circus. He had a great time. He really enjoyed seeing the show live. His Uppertone workout system is fully assembled and David is now using it on a regular basis. The first time he used it he had HUGE smile on his face. Thank you all for helping to make this happen. 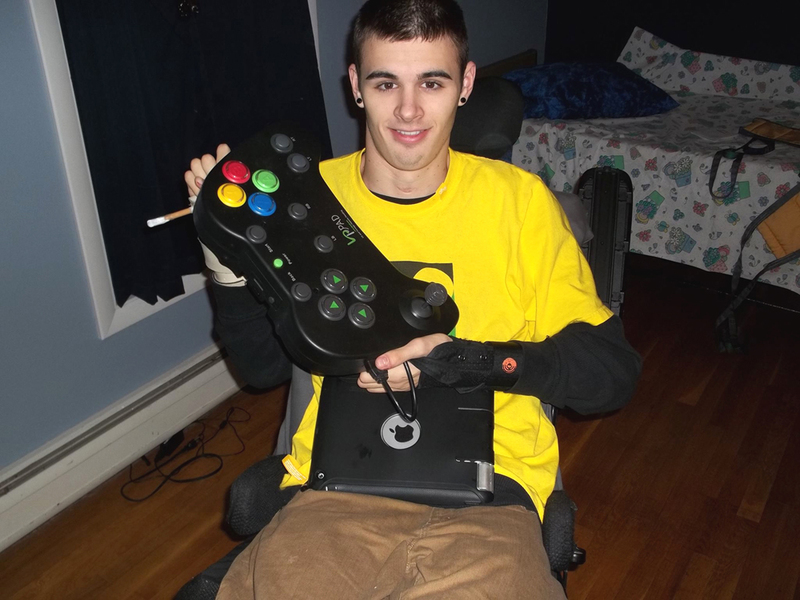 Just recently he got a giant Xbox controller. The box is large enough for him to use and comes with a control knob on a pole that he can use with his chin to work games. This evening he was gaming with his friend Sam. It was kinda nice to hear the sound of racing cars in the house again. Now that his back is better David’s goal over the next month is to get out and thank as many people as possible in person for their support and help. Tomorrow his goal is to try snow tubing with friends here in his back yard. We live on the side of a hill. We will keep you all posted on how it goes. David is very lucky to have the support that he has received. It helps to keep him motivated. It gives him and us hope, and for that we are very grateful. The Boston Bruins Alumni Classic to benefit the Crotched Mountain Accessible Recreation and Sports program where David got to meet Governor Lynch, Rick Middleton and the rest of the Boston Bruins Alumni team and help them raise money for CMARS. In the Spring David did a Tag Sale. In August at the high school, with the help of his friend Caragh, a 5K Fun Run. 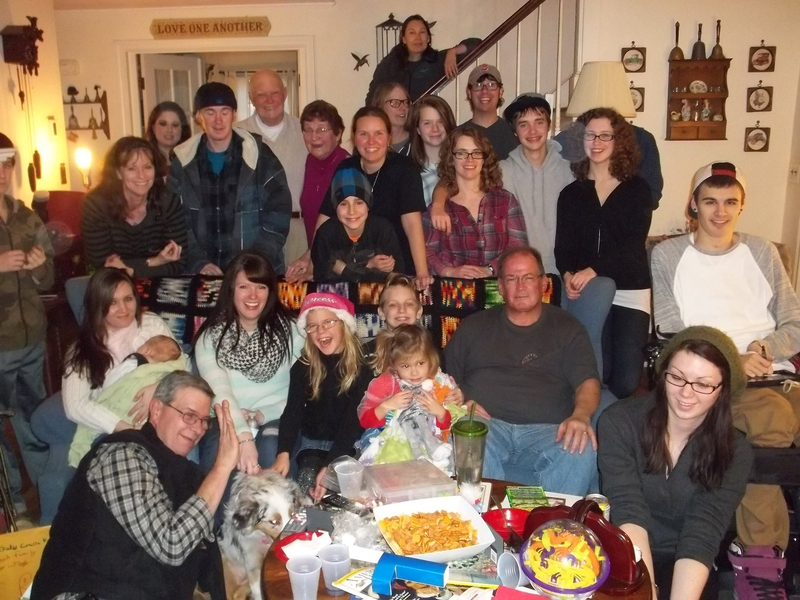 In November a group of individuals from the area, with the help of the Branch River Theatre group, put on a show to benefit David called, “Way Off Broadway”. There have been many corporations, retail business, restaurants, and nonprofit groups which have all helped raise funds for David. Some of these include: StingRay Optics, Architect Michael Petrovick, Williams Construction, Land Surveyor Wendy Pelletier, Stebbins Spectacular Painting, Granite Gorge Ski Area, Elm City Bagels, Amicci’s, Andy’s Cycle, Ted’s Shoes, Blanchard & Sons Drywall, Park Ave Deli & Market, Canon Solutions America and the many, many others who have helped David. We Thank You All! There are also many individuals and sustaining members who have helped with their donations throughout the past year. These individual donors come from the local community, the state, Massachusetts, Rhode Island, New England, across the country and from around the world. 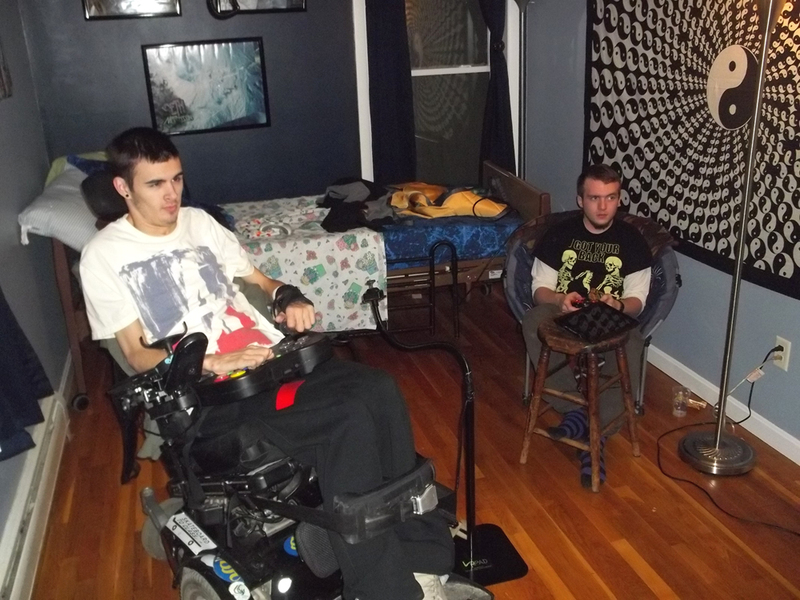 There are also many individuals that have helped by donating their time for such things as the move from Main Street to Old Walpole Rd, staining the kitchen cabinets, cleaning the new house to get it ready for us to move in, installing David’s TV, or just hanging out and spending time with David. There are also Individuals that donated items such as food, gift certificates and furniture. Just last weekend Terry, our neighbor, donated a bookcase that he had in his garage. It came at the right time. We were in the process of cleaning and organizing the basement to make room for David’s new Upper Tone (see photo above.) Thank you Terry and thank you everyone. 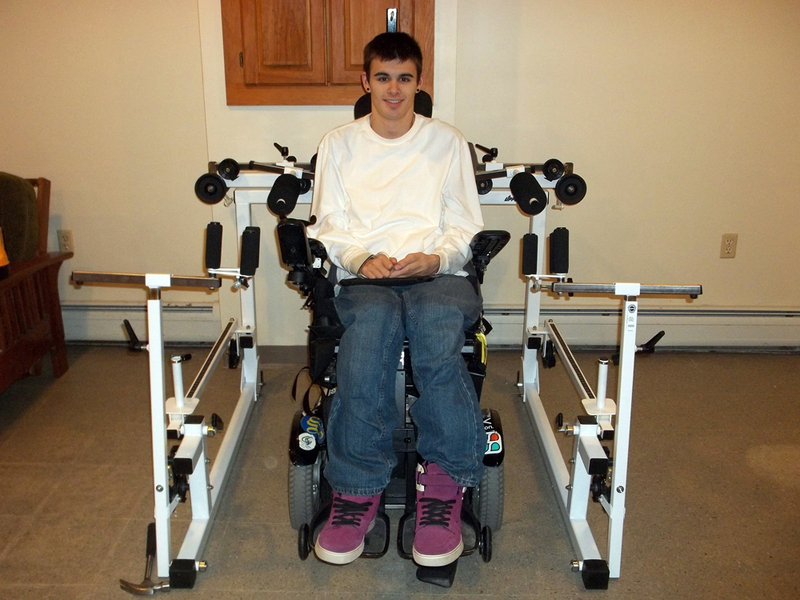 Over the past year, with your help, we were able to raise funds to make the house wheelchair accessible, get David a manual wheelchair and get an Upper Tone exercise station to help strengthen his upper body. It has been an amazing year. We could not have done it without your support. You all have helped David come a long way. You all have touched David, my family and myself deeply. We are very grateful for your support and can not thank you all enough. Be careful out there. Last weekend David’s grandfather got hit by another car that was waved into his lane by another driver in the turning lane. His car was totaled but he was not hurt. With the Holidays upon us, I would like to share a personal experience with our many friends out there about drinking and driving. As you may know there are some people who have had brushes with the authorities from time to time on the way home after a “Social Session” out with friends. Well, two days ago, I was out for an evening with friends and had several cocktails followed by some rather nice 30 year old Bourbon… Feeling jolly, I still had the sense to know that I may be slightly over the limit. That’s when I did something that I’ve never done before —– I took a cab home. Sure enough, on the way home, there was a police road block, but since it was a cab, they waved it past. I arrived home safely without incident. This was a real surprise as I had never driven a cab before. I don’t know where I got it, and now that it’s in my garage, I don’t know what to do with it.